If this statement sounds contradictory or, at the very least, contrary to expectation, welcome to the world of Madeleine L’Engle. Tomorrow Disney will release its 2018 film of L’Engle’s classic “Wrinkle in Time,” directed by Ava DuVernay, and starring Oprah Winfrey, Reese Witherspoon, Mindy Kaling, Storm Reid, Zach Galifianakis and Chris Pine. A curious New Hampshire connection is that Jennifer Lee, a graduate of the University of New Hampshire – the first female director of a Walt Disney Animation Studios feature film and winner of the Academy Award for Best Animated Feature for “Frozen” – also is an avid L’Engle enthusiast selected to write the screen play for “Wrinkle.” Written in 1959, “Wrinkle in Time” was rejected by 26 publishers even though L’Engle already had published six books. It found a home with Farrar, Straus and Giroux, which eventually published it as its first children’s book in 1962. “Wrinkle” won the 1963 Newbery Medal, the Sequoyah Book Award, the Lewis Carroll Shelf Award, and was runner-up for the Hans Christian Andersen Award. It has been published in countless editions – 10 million copies – and has never been out of print. Yet, from the start, it was a problematic bestseller. “Wrinkle” baffled editors, defied trends and ignored the market. It didn’t fit any category and took on difficult topics like good and evil. Was it for children or adults? Was it science fiction? If so, why was there a female protagonist? Wasn’t it just a bit too philosophical? To add to the puzzle, Meg Murry was not the classic heroine: She was plain, awkward, insecure and outspoken, painfully aware of her faults, but also memorable as her faults eventually save her life. One editor called the book “distinctly odd.” To add to the enigma, “Wrinkle” became one of the most celebrated – and banned – books of the American Library Association, at 23rd among the most frequently challenged books of the 1990s. Meanwhile, L’Engle battled for decades with producers who kept trying to rewrite the story, omit certain characters or convert it from a science story to a science fiction story- but L’Engle stood her ground. At the same time, L’Engle happened to be reading the “new” quantum physics. The two merged not because L’Engle knew what she was doing, but precisely because she entered her unknowing. The tale hinges on the tesseract – a geometrical model formed from taking the square of a cube, a complex mathematical idea that she took one step further, – into time. If time were like a tesseract, there might be other ways to skip over “gaps” to shorten the journey. Hence the “wrinkle” in time that enables characters Meg and Calvin to travel in time. L’Engle went toward the enigmas of quantum reality in the late 1950s, when barely anyone knew what quantum physics was. Physicists were searching for metaphors to explain what did not make sense to the “logical” mind. 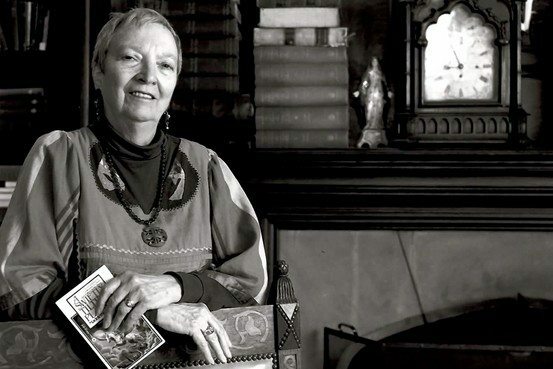 By training herself to listen to what she did not know, intellectually L’Engle became perhaps the first writer to bring quantum physics out of the laboratory – in its infancy – and into the living room in a young adult novel. But “Wrinkle” is so much more than scientific fantasy. Like a fine poem, it keeps revealing new truths in layers. The more she discovered about physics, the more wonder L’Engle saw in Creation and the Creator. As it turns out, “Wrinkle” – and L’Engle – both were way ahead of their time. “Wrinkle in Time” demonstrates that the world, that reality is much larger and wider than human imagination, that it is most likely contradictory to our logic, and filled with unexpected realities we cannot fathom – and evil may be far more pedestrian than we think, as simple and common as clinging to convention or pre-judging others because they differ from us. In “Wrinkle,” L’Engle makes her own argument for both the gap and the journey – the gap between doubt and certainty. When you face a gap between what you know and the unknown, do you bring your sense of wonder or a bag full of judgments? At no time in history are we made more aware of mystery than now when science surprises us every day. L’Engle warns us to take our humanity with us on this journey across the gap from what we know to what we do not know-and may even fear because it is new or different. She heralds the power of the individual to impact the cosmos, the power of art to bring cosmos out of the chaos of the world.